Damodarastakam is a popular prayer dedicated to Sri Krishna. The prayer is chanted on all days in Kartik month. It is also chanted on special occasions dedicated to Sri Krishna. This particular Damodarastakam prayer is in Hindi in pdf format. It contains the lyrics with meaning and explanation in Hindi. Damodara or Damodar is one among the twelve important names of Lord Vishnu. Sri Krishna got the name Damodar when He as a child was tied to a grinding mortar by Yashoda, His foster mother at Vrindavan. Story of Sri Krishna moving the wooden grinding mortar ends when he pulls it through two trees that were standing close by in Vrindavan. This he did to give moksha to Devas who were cursed by Sage Narada. Sri Damodara Ashtakam from the Padma Purana is chanted by devotees in the Kartik Month. Chanting it is a sign of unfathomable devotion to Srihari Vishnu. Helps in controlling lifestyle diseases like diabetes - blood pressure etc. Chant the prayer and then meditate. 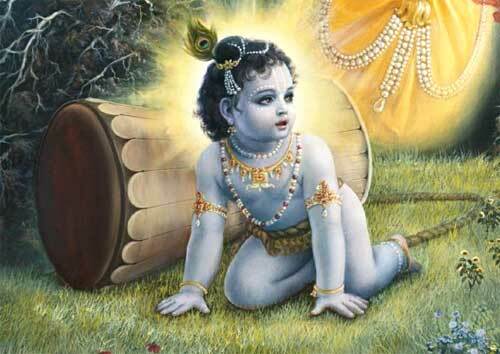 Think about the leelas of child Krishna.